My guest room has been the latest room in the house to be beautified. I have settled on a woodland theme, a while ago I made a few cross stitch lovelies from Storyland Cross Stitch. My husband and I brought the gorgeous picture on the fireplace on our honeymoon in Switzerland. 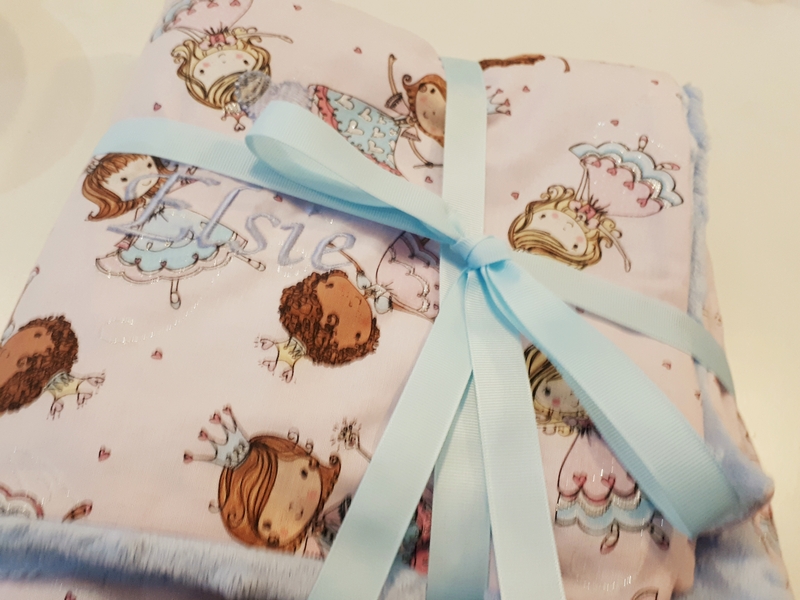 Recently I stumbled upon Sew Charming in Lutterworth, although my first love is Crafty Sew & So I must admit I somewhat fell in love with the beautiful range of fabrics in store. 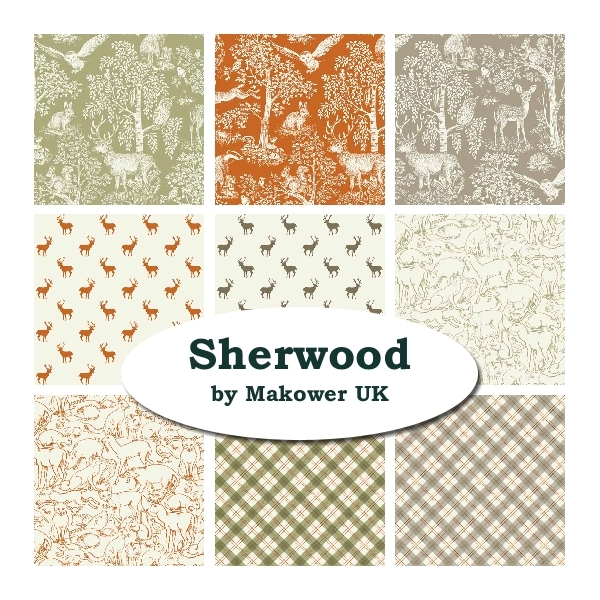 I scooped up this Sherwood collection along with a wonderfully soft Linea Linea fabric, and quickly got to work on my cushions, I basically raided Pinterest for different ideas. I used the same envelope cushion pattern as I did in my last blog. I decided to go for appliqué over patchwork because I’ve just brought myself a fancy new Brother sewing machine which has lots of lovely top stitching. For two of my cushions I used wonderful free downloads from Love Patchwork and Sewing, Issue Seventeen has a perfect fox appliqué, it’s all to size being printed out on A4 paper. I also took triangle templates for my next cushion from issue thirteen. My final cushion I used up some hexes that I’ve got laying around for a blanket which I’m not sure will ever get finished. Here they are all together with a cushion I cross stitched along with the frames. I think after Christmas I might hang up the wreath amongst the cross sticth the colours match perfectly. If you want to see how I made this check out my other blog with Crafty Sew & So. Also if you love the woodland theme check out Waterstones book of the year, The Fox and the Star. It is uniquely beautiful both in words and illustrations. Recently I have started running a Stories & Rhymes group at my local library. It’s lots of fun. As the name suggests, A lovely lady and I read stories and sing songs to kids. It’s for children up to five, but we generally get two and three year olds. 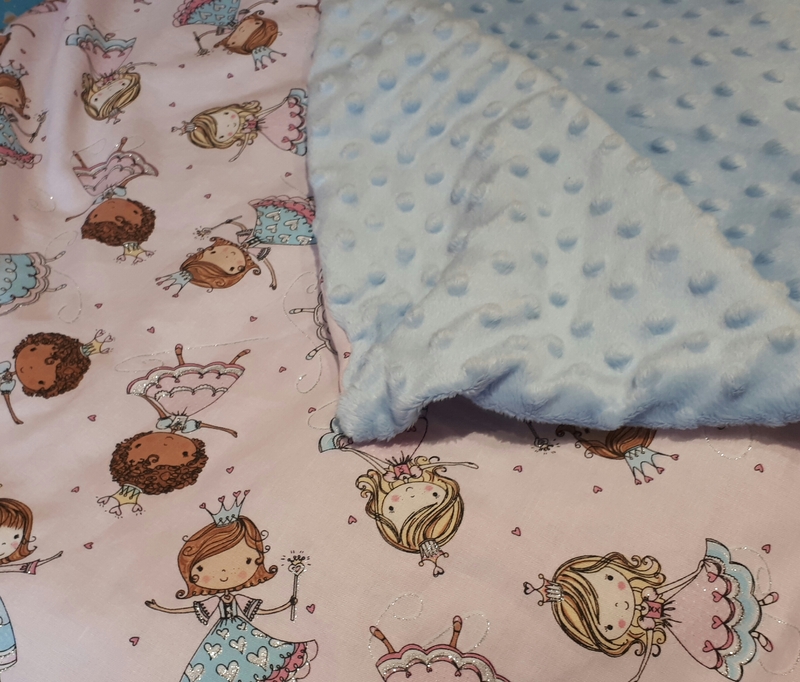 The woman who runs it with me has two kids and she brings in a mat, cushions and big cuddly toys to make the sessions feel a bit more welcoming. She also found an uncovered sofa cushion in her attic which i offered to cover to give the sessions more of a cosy feel. I decided to do an envelope cushion with some old sheets, mostly because I was too lazy to add a zip. I’ve never actually made an envelope cover, my method thus far with cushions is sewing the cover around a pad and hope they never need to be cleaned. Google came to my aid and I found this Ikea tutorial. and fudged it as much as I could to work for a sofa cushion. I stuck a load of newspaper together and traced out the shape of the cushion, I basically guessed how much seam allowance I needed, roughly a couple of inches, it turned out a big baggy so would probably go for less next time. I used the same pattern for the two back pieces but folded it so it measured two thirds the length. I ended up making a a silly mistake and didn’t turn the pattern over for the back pieces. It wouldn’t matter for a square cushion but the awkward shape makes it vital. I made another upper piece and saved the other one for the next cushion (there’s another sofa cushion someone in my friends loft). I measured the circumference and cut out stripes off newspaper leaving a wide seam allowance. I attached them together and then realised that was useless as I didn’t have a single piece for the whole band. It was still helpful I just cut the strip to fit the remaining pieces of fabric. Now for the sewing, first thing I had to do was pin and stitch all the individual pieces together. Next I attached the front section to the band, right sides facing together. once that was done I double hemmed each of the back pieces, pressed and then pinned in place. I then sewed along the fold on both pieces. The final step is to attach these two pieces the Ikea tutorial makes it sound so simple but this is the bit I found most complicated. most likely because of the awkward shape. I sewed one piece to the band, right sides together. I then sewed the second piece to the band, it ended up a little wonky so I unpicked it and made it a little straighter. It doesn’t look too bad, more than acceptable for a toddler group. I forgot (didn’t want to) take a picture of the back, and now it’s made it’s home at the library. I am currently making a set of cushions with the same method, I’m hoping they will work out a lot better. Here’s a sneak peak. Crafts for my fabulous party. I hosted my birthday party in which the theme was vague to say the least. I very much wanted to dress up as Lis a house spirit from Seconds by Bryan Lee O’Malley. 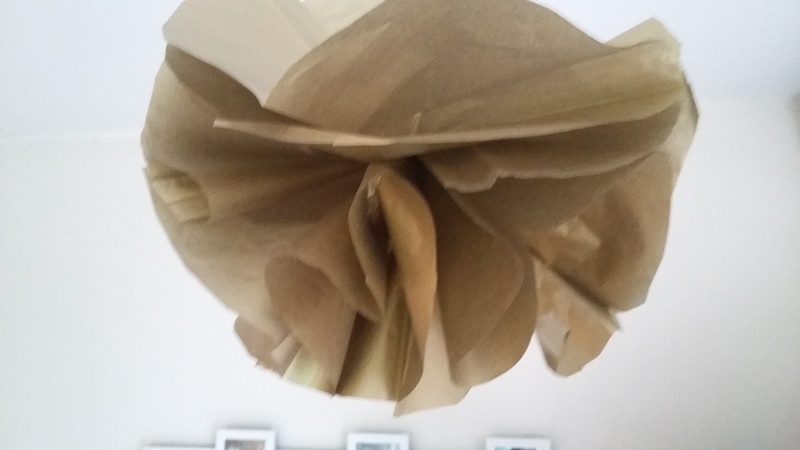 I made paper pompoms to hang from the ceiling. It was simple but time consuming, all you need is paper/fabric, scissors, needle and thread. For each pompom cut out six circles, either out of crepe paper or fabric. I tried to be painfully accurate at first but you can’t really tell so long as they’re roughly the same size with curved edges. Fold each circle in half and then half again. Tie a not in your thread and pull each piece through and tie each end of the thread together. For individual pompoms you are practically finished. Gently pull out the folded circles to form a ball. Tie another piece of thread / ribbon to the pompom and attach it to the ceiling with blue tack or whatever you have to hand. If you want to make a chain keep the pieces folded and make the desired about. When you’re done tie a not in the end of a long piece of thread or ribbon and pull the first pompom through. Tie another knot to keep the pompom in place. Continue this until you have a garland of pompoms. 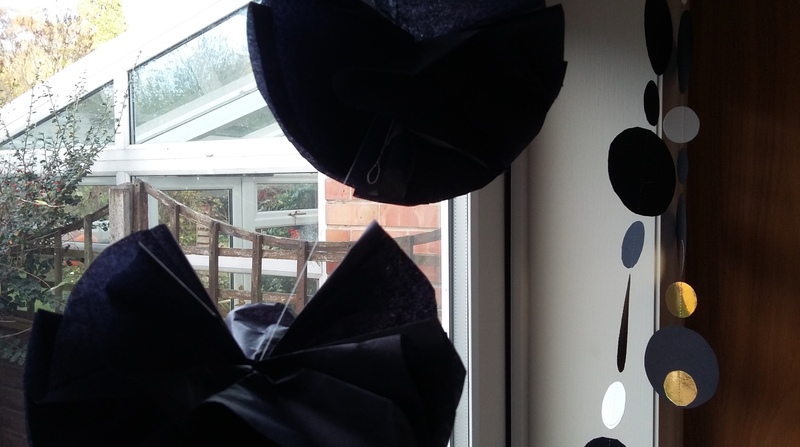 Pull out the folded circles and attach to doorways, mirrors, ceilings etc. 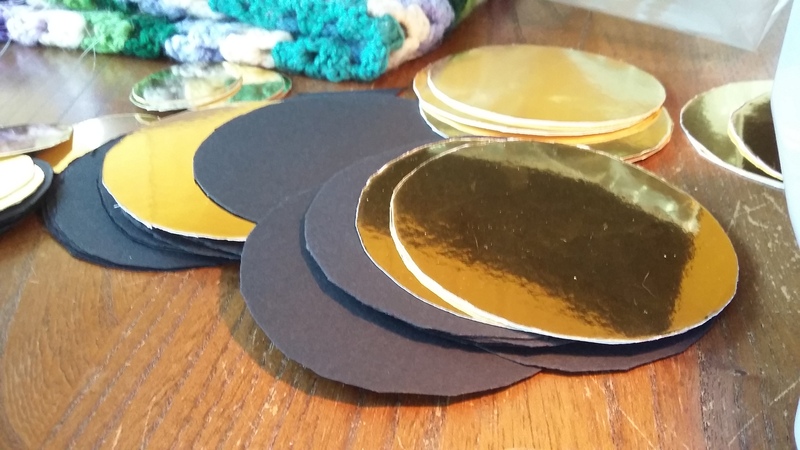 cut out cardboard circles of your desired colours and shapes, I used mostly black with a few splashes of shiny gold. I used templates from around the house, a spool of thread for the little ones, and the base of a bowl for the larger ones. 2. Start sewing! I picked up some invisible quilting thread but white would probably work just as well. make sure you leave lots of thread before you start sewing so you can hang it up later. I used my sewing machine and threaded through each circle (I’m sure it would be just as easy to hand sew). you can sew two on top of each other or sew them off centre to give more movement. With the left over circles and pompoms I decorated the walls with black and gold. for the finishing touches I brought a mix of black and gold table clothes, cups and plates. Though I had a wonderful time and loved seeing all my friends, the day was not free of anxiety ridden turmoil. I had too keep checking myself to make sure I was not too busy trying to be the ‘perfect host’ to enjoy myself. My little house exploded with unprecedented noise. If it got too loud or overwhelming I slipped off upstairs to see my lovely cats (they were not best pleased about all these people in their house).